Construction of the voestalpine Texas iron reduction plant on the La Quinta Ship Channel is moving rapidly toward completion. System testing has begun and startup of manufacturing activities is scheduled in the coming months as part of a two-stage commissioning process. The plant will be the largest of its kind in the world. More than 2,000 construction workers have been on site during peak construction. Work on the $740 million project began in April 2014.
voestalpine will use natural gas to process iron pellets to produce Hot Briquetted Iron (HBI) with an annual capacity of two million metric tons. HBI is a high-grade feedstock used in the production of high-quality steel. voestalpine has a contract with the Water District to provide 1.1 million gallons per day of raw water that will be treated in a water filtration facility integrated into the plant. It will produce water for the primary component of a two-stage heat exchanger cooling system and for process operations. 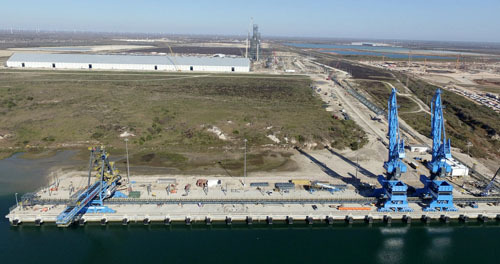 voestalpine has installed intake and return structures and will use saltwater from Corpus Christi Bay for the second component of the cooling system. Bay water will make a single pass through the system before being returned to the bay. Work was completed in September on installation of 1.5 miles of 12-inch PVC water line which connects the plant to the Water District's 42-inch Gene Dressen raw water supply line near the north boundary of the Port of Corpus Christi Authority's La Quinta property. voestalpine provided the $530,000 required to plan and build the pipeline. The line was installed by Jhabores Construction Co. under a contract awarded by the Water District. 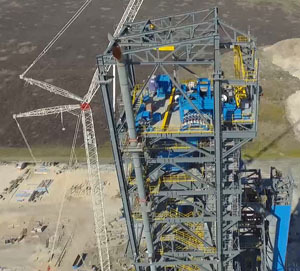 The voestapine facility includes an elaborate deepsea dock with massive equipment for unloading iron ore pellets and loading out finished iron. Half the plant's production volume will be shipped to voestalpine's existing Austrian steel mills in Linz and Donawitz for conversion into various high grades of steel. The company has indicated that the remainder of the production will serve as a strategic reserve and marketed to partners interested in long-term contracts. At the core of the plant is a special iron pellet reaction vessel 50 feet in diameter and 420 feet tall inside a tower that is a total height of 450 feet. Iron ore pellets will pour into the top and spend approximately two hours flowing through the low-pressure reactor vessel where they will reach 1,300 degrees F and react with the natural gas to strip away bonded oxygen. Once the material leaves the reactor vessel it will be formed into fist-size briquettes of 92% pure iron ready for the steel making process. The facility includes a massive 2,000-foot-long enclosed warehouse where iron ore pellets will be stored prior to processing.